Highest quality and low price linear polarized 3D glass! MC-3DG is equipped with polarizer which is also used for LCD displays. Cross transmittance ratio = less than 0.08%. High-contrast polarizer eliminates even slightest ghost effects. * Thick, fine grained, and springy paper frame. Highest quality, linear polarized 3D glass at Low-Prire! 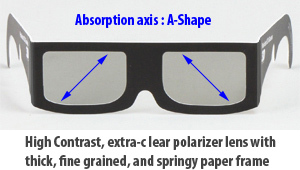 SP3D-LP is equipped with polarizer which is also used for LCD displays. Cross transmittance ratio = less than 0.3%. High-contrast polarizer eliminates even slightest ghost effects. Highest quality, circular polarized 3D glass at Low-Prire! SP3D-CP is equipped with polarizer which is also used for LCD displays. Cross transmittance ratio = less than 0.2%. 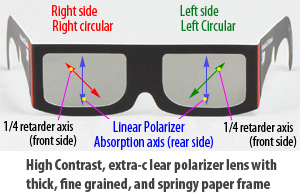 High-contrast polarizer eliminates even slightest ghost effects.